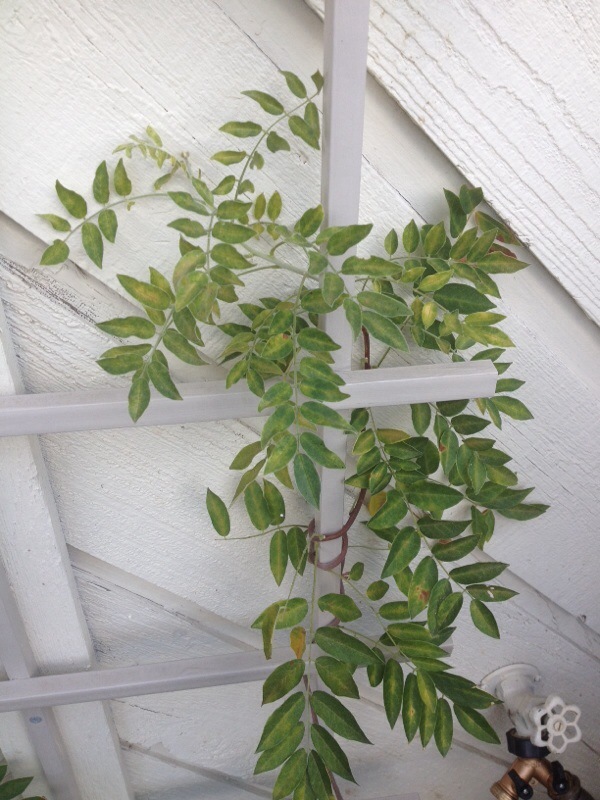 Although it is hard to be certain, one of two things may be affecting your wisteria. The first is sun scald, or just minor sun damage. This can result from unusually high temperatures and/or insufficient watering during that time. Leaves will yellow and often take on a pale or peaked appearance. Cooler temperatures and regular watering usually fix this. The other is nutrient deficiency. Wisteria are pretty heay feeders and need a regular regimen of all purpose, balanced fertilizer throughout the growing season. Check both of these cultural conditions first. Although a fungal disease called leaf spot is possible, it doesn't quite match your plant's symptoms. Check with a local nursery or the extension service in your area for more definite information. 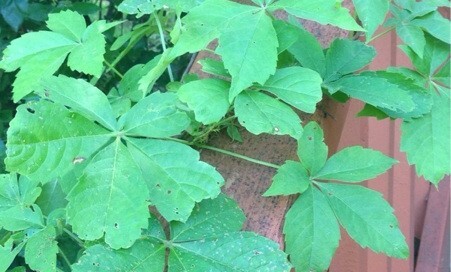 This appears to be Virginia Creeper, a deciduous and vigorous vine. One of its characteristics is having five leaflets (in most cases) that turn red and purple in late summer and autumn. Can grow in a variety of sun, partial sun, shade conditions and survives on moderate water. Following non-showy flowers, bears purplish-black berries on reddish-mahogany colored stems. 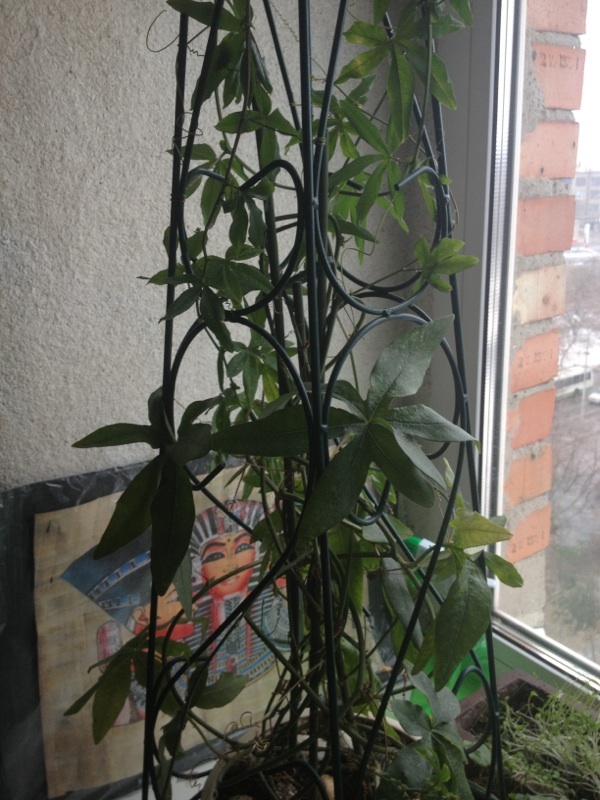 A climber, it clings to support surfaces by suction disks at ends of tendrils. 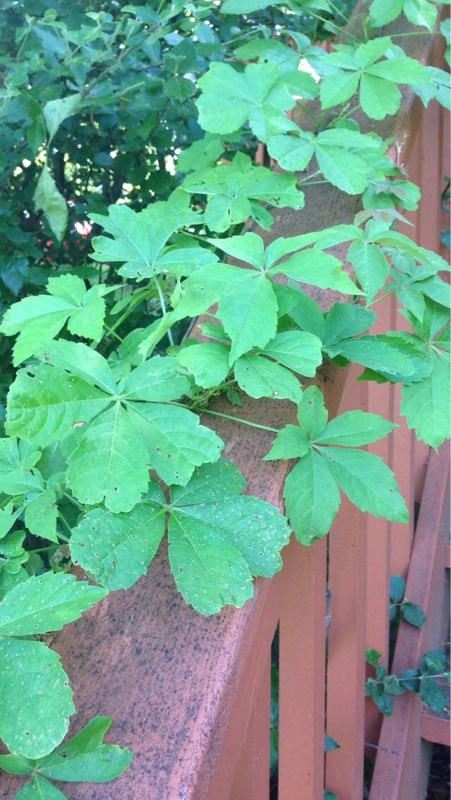 A good adage for this plant: "leaves of 3 let it be, leaves of 5 let it say alive" since it is often confused with poison ivy. It needs some control if you keep it around since it is a vigorous grower. 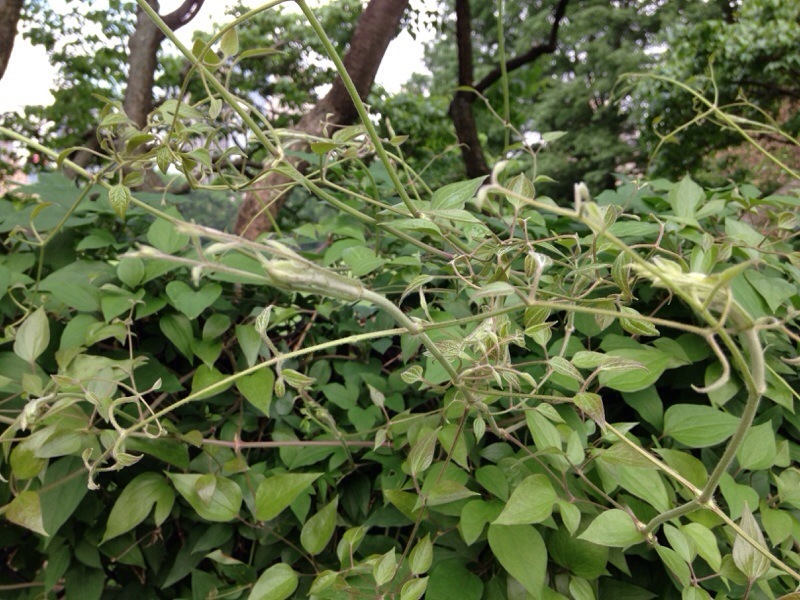 Cut the vines and when they resprout, spray or paint the vulnerable new growth with an herbicide. clematisinternational.com/‎ for more information on clematis. This is indeed a Stephanotis, a beautiful tropical vine with fragrant white flowers. As a houseplant it grows best in bright, indirect light. Outdoors where there is no extended periods of frost conditions, your plant will thrive in part shade. Needs regular water and feed with a slow-release fertilizer formulated for blooming plants. 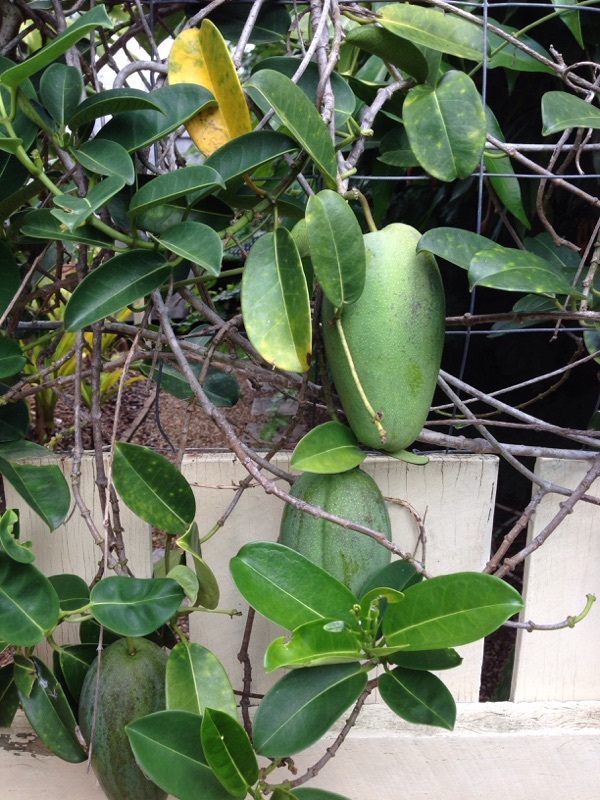 When it matures, it will form seed pods such as yours that are 5-6 inches long and are shaped like green mangoes. In about 6-9 months, the pods will yellow and crack open revealing ripe seeds. However, once the seed pods form your plant will not bear flowers because it is expending all its energies into producing the seeds. If you are not interested in propagating the seeds, then suggest you clip off the pods so that your Stephanotis will bear blossoms. 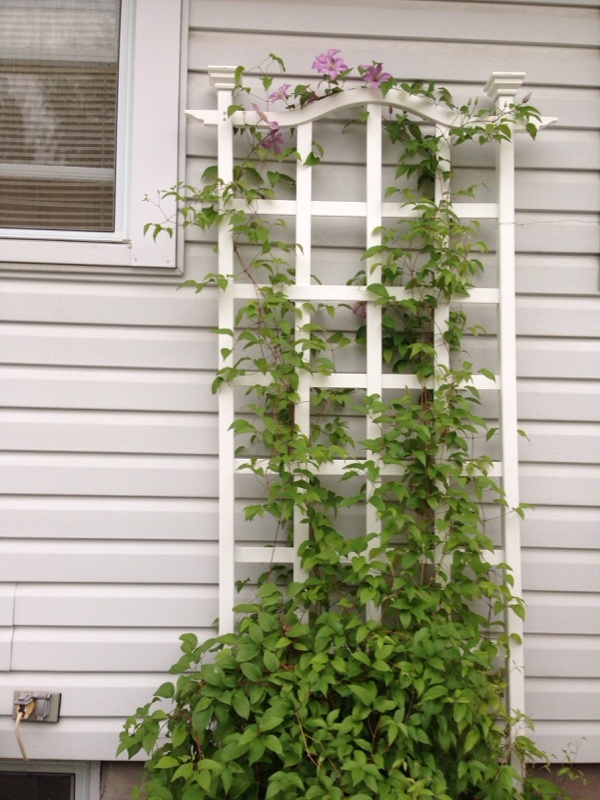 Clematis may take 2-3 years to begin blooming. 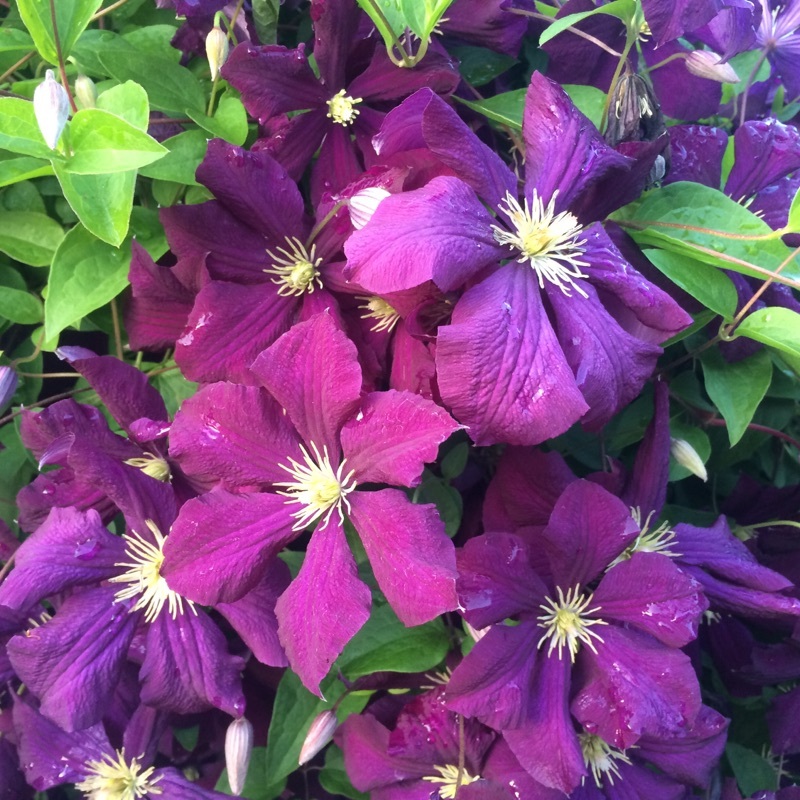 Here are a few care tips that may help your plant flower: most Clematis prefer their "feet" in the shade and their faces in the sun, so apply a layer of mulch around the plant leaving about 2-3 inches clear around the base of the plant. Water regularly when in the growth and bloom cycles and feed with a slow-release or organic fertilizer after blooms are spent. 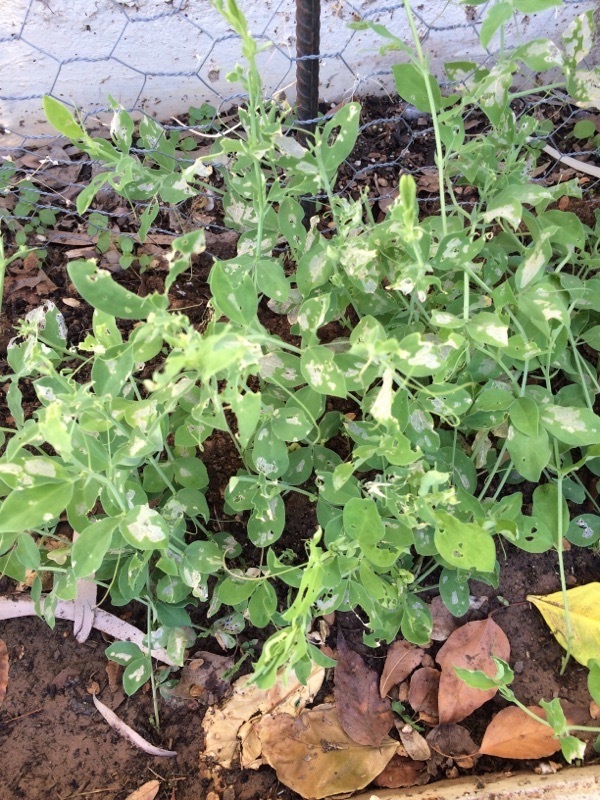 Be careful not to use a high nitrogen fertilizer as that will encourage leaf growth over flower formation. You may also want to consult these clematis FAQs: http://faq.gardenweb.com/faq/clematis/ Also suggest you show your photo to a horticulturist at your local garden center to find out if they any other suggestions for you. 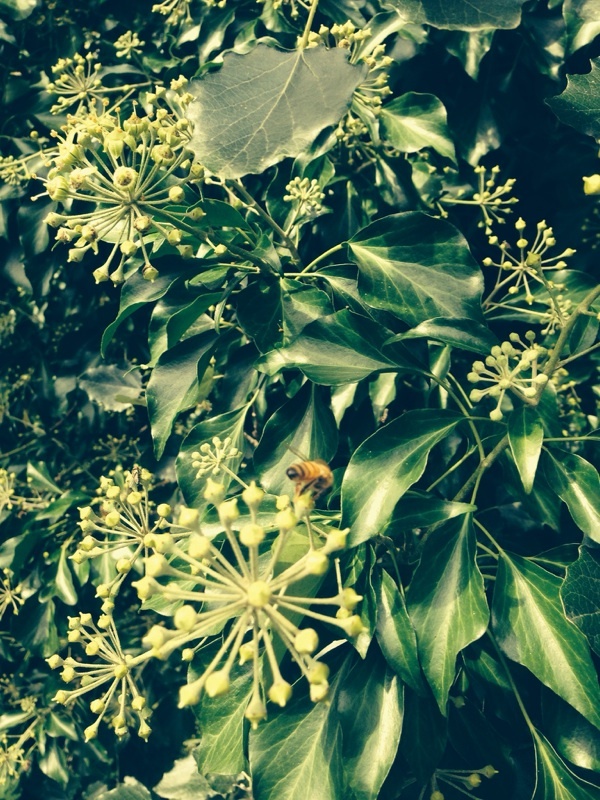 Photo is a bit blurry but it looks like English ivy. In the open, ground ivy can cover acres or climb tall trees, but it is easily kept small in a container or by hard trimming. There are many varieties differing in size, leaf shape or color. The distinction of "adult" refers to a ground cover ivy that has matured and climbed, producing berries (which the birds eat and spread the plant.) The classic ivy shape of the leaf often morphs into a shape that is not commonly recognized. Be careful pulling it off trees and structures. Those hairs that hold the plant in place, will take what it is holding onto with it. The best approach in removing climbing ivy is to cut it back at the base, and wait for the plant to die back before removing, should you wish to control it. Your plant appears to be a lovely Clematis. Clematis is slow to get established. Often it can be three years before they really start to climb and flower. 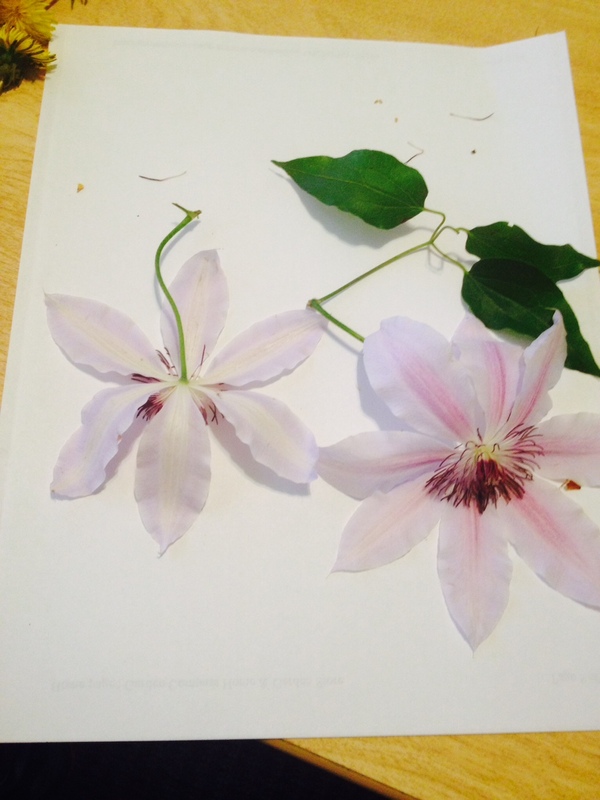 Clematis grow and flower best in full sun, with their roots mulched or shaded and their faces in the sun. Water regularly and feed with a slow-release or organic fertilizer formulated for blooming plants. 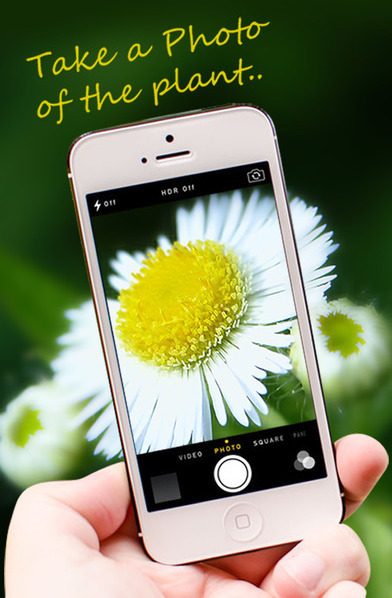 If brought indoors during the winter months, provide as much bright light as possible and keep moist but not soggy. Do not allow plant to sit in water as this may lead to root rot. Take outdoors when weather is no longer frosty. There are two possible causes for this condition. One, and the most likely, is a tiny leaf miner. These are the larvae of equally tiny moths and they tunnel in this erratic pattern through a leaf, leaving scar tissue. In small numbers, they are rarely a problem, but these have clearly gotten out of hand. They are very difficult to control because they are inside the leaf but look for Bt formulations that might help. The second is one of the many versions of bean beetle which also leaves evidence much like this. These can be controlled with sprays specifically designed for beetles, check with a local nursery or the extension service for ones for your area. They can also be pulled off by hand. And, in consolation, you can consider replanting, it is not too late in your area.